How much electricity is consumed in Ontario? It's a question related to how much electricity is generated in the province, but there are important differences that should be displayed. This post will provide better figures for consumption, at consumers' meters, than those popularly given. Ontario Demand represents the total energy that was supplied from the IESO Administered Market for the sake of supplying load within Ontario. So it's supply, and not metered demand. 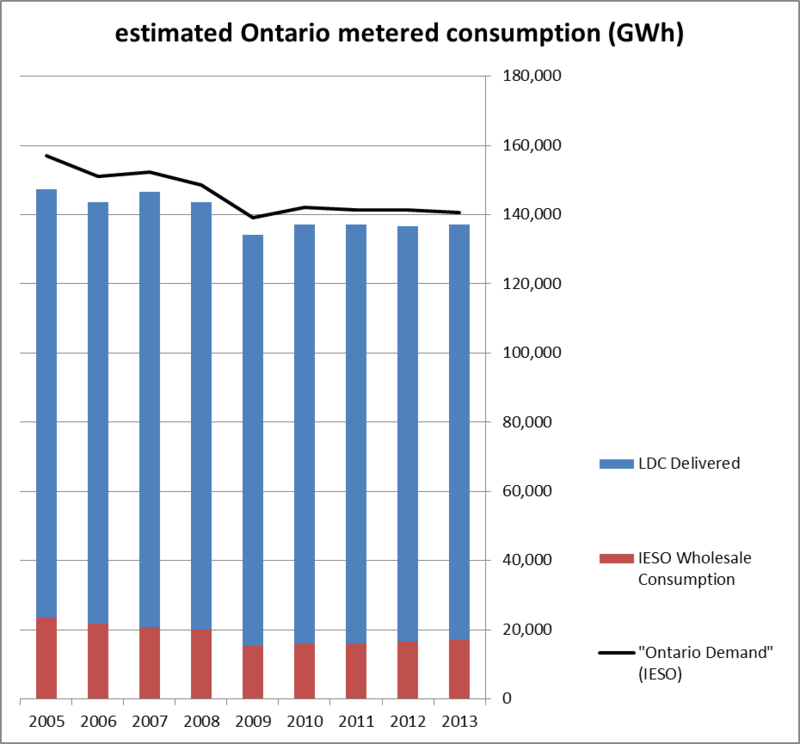 "Ontario Demand" is something the IESO reports on in 5-minute intervals, hourly, weekly, monthly, etc. 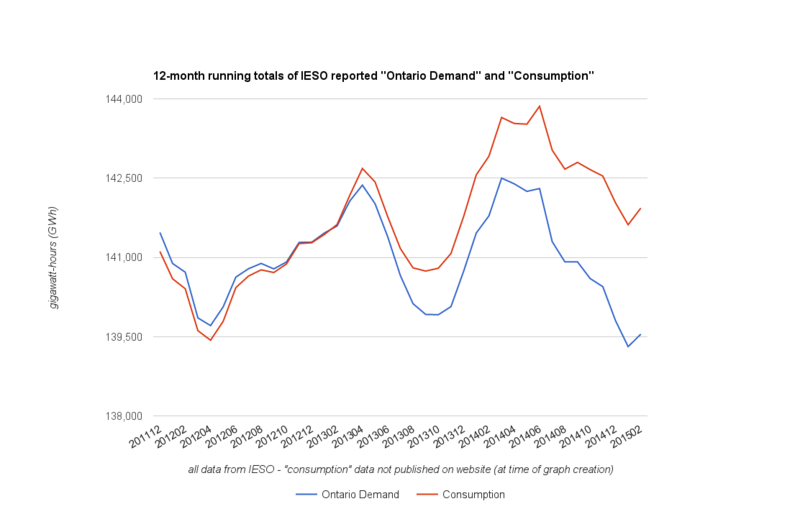 The monthly totals of "Ontario Demand" match the "Energy Demand" totals in documentation created with the IESO's 18-month outlooks. Only 2 of these categories should be considered consumption: wholesale consumption presumably being the metered consumption of large wholesale consumers, and LDC consumption measuring power delivered to the LDCs, but still not at the end consumers' metered consumption. line losses and generator are between 3 and 4% of this IESO definition of "demand". 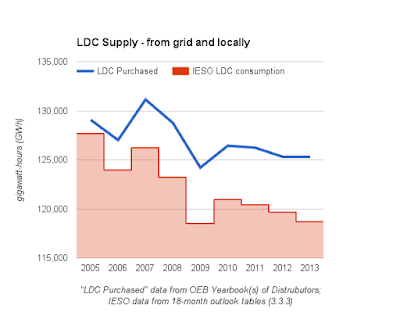 The energy demanded by LDCs from the IESO's grid is not, as I displayed in my previous post, all of the energy supplied to LDC's. There are generators embedded in LDC territories, and these embedded generators are increasing - primarily due to feed-in tariff offers for renewables. Each year the Ontario Energy Board (OEB) produces a Yearbook of Electricity Distributors, and two figures displayed in the publication are "Total kWh Purchased" and "Total kWh Delivered." 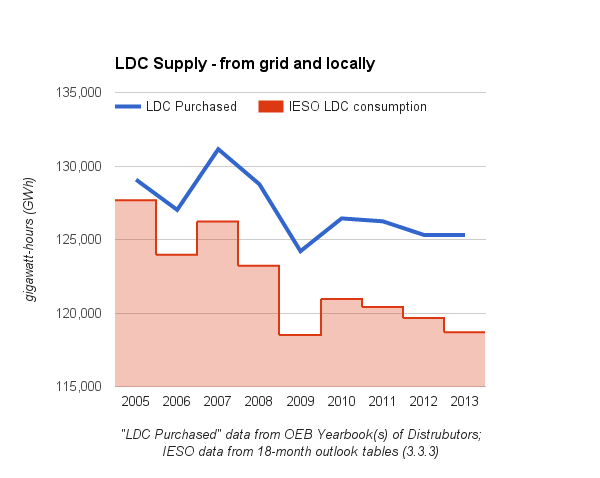 Matching these numbers to the IESO data is imperfect (as data is), but charting the IESO's "LDC consumption" and the OEB yearbook's "Purchased" reveals the expected gap, which estimates supply embedded in LDC territories. The estimated embedded supply is higher using this methodology than in the loosely related method of my previous post - with the gap between what the IESO sold and what the LDC's bought being over 6 TWh in 2013 (the last year with available data for the OEB yearbook), whereas the simpler method in my previous post indicated only 3.3 TWh. I suspect a majority of the discrepancy lies in defining consumption, and the measurement of generator consumption. 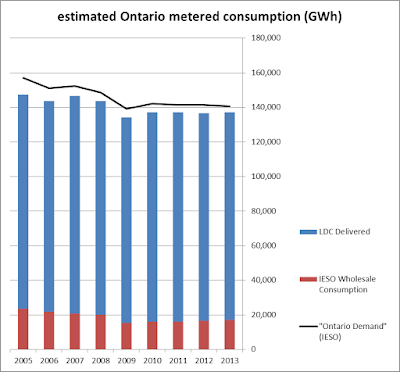 An estimate of annual Ontario metered consumption should include the IESO's direct "Wholesale Consumption" and the OEB Yearbook's "Total kWh Delivered" - altered to GWh (1 million kWh). The total estimate of consumption rounds to 137 TWh (billion kWh) each year from 2010-2013. 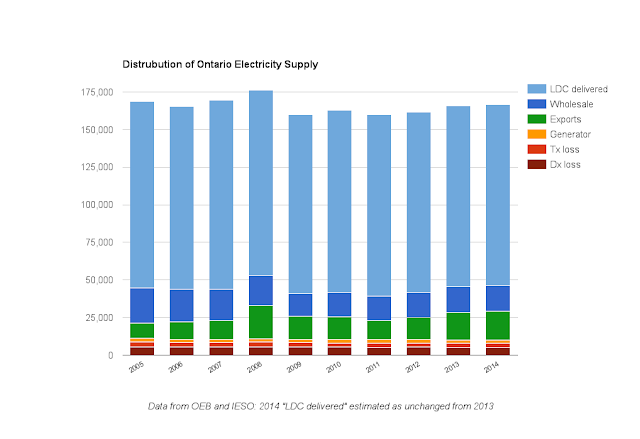 This remains below what the IESO reports as "Ontario Demand" right through 2013, but the gap is narrowing as embedded generation grows towards the total of losses in transmission and distribution grids plus generator consumption. For 2014, I expect the numbers in the next Yearbook of Distributors will show deliveries of power very similar to 2013, which due to increased wholesale consumption will push metered end-use consumption closer to 138 TWh. In meeting the 137-138 TWh of annual consumer consumption Ontario has experienced the past 5 years supply procured has grown to over 163 TWh, and perhaps as high as 167. While the different data available provide for a range of possible estimates, all show supply increasing, and because demand has to increase with it, that shows in rising exports. Exports are now at record highs, and market prices at record lows. This can't be a surprise where demand is stagnant and supply is increasing. The IESO was not unjustified in reporting only on transmission grid numbers in past years, but the Ontario Power Authority was folded into it for 2015 so it is now a huge shortcoming that reporting omits embedded generators, most of whom must be paid by the IESO. The IESO is also the keeper of smart meter data - a task that would seem impossible for 4-5 million consumers' meters if a much, much smaller subset of embedded generators can't be measured competently. The IESO will provide another set of numbers upon request, which are the "consumption" numbers used, I assume, as the denominator in calculating global adjustment rates. My understanding is that these figures include the IESO data excluding transmission loss, and some generator consumption, plus embedded generation although it is reduced to account for distribution loss. I'll use these figures in an upcoming post explaining issues connected to the Class A global adjustment mechanism, or ICI (industrial conservation initiative). 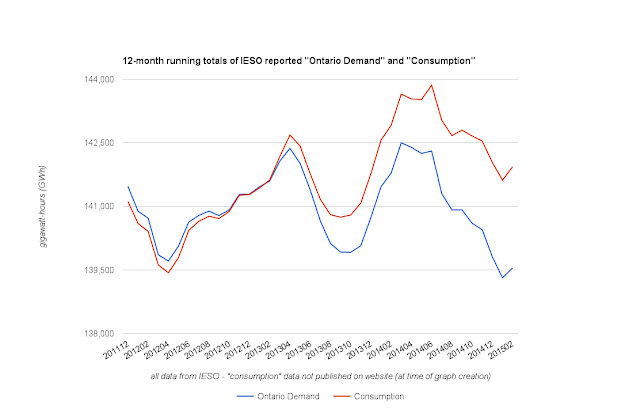 To conclude this post I'll simply show the 12-month running totals for what the IESO reports as "Ontario Demand" and what the IESO will, by request, advise is "consumption" - displaying both the growing impact of embedded generation, and the growing inadequacy of reporting figures excluding embedded generators.